I can assure you that Henry Ford knew exactly how long and how much it cost to produce the Model T. Although it may seem difficult to make comparisons between the automotive industry and modern day beef production, many cow-calf operations are business enterprises…large business enterprises. Yet financial benchmarking and accurately documenting production costs are not necessarily high on the “to do” list of most cattle producers. One of the best reasons to know what it costs to produce a calf or what your total feed and non-feed costs are, is that it allows you to quickly evaluate emerging opportunities such as grazing a neighbor’s cover crop, or an additional circle of corn stalks. Thus, if you don’t know your production costs, I would encourage you to think about them. Tax time is a great time to take a good look at your business and calculate your production costs. 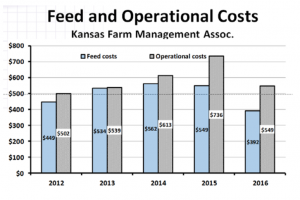 If you would like to get a better idea of what it costs to produce a calf in Kansas, the Kansas Farm Management Association (KFMA) Enterprise Reports provide that information in a one-page summary that can be accessed on the Ag Manager website (https://www.agmanager.info/kfma). 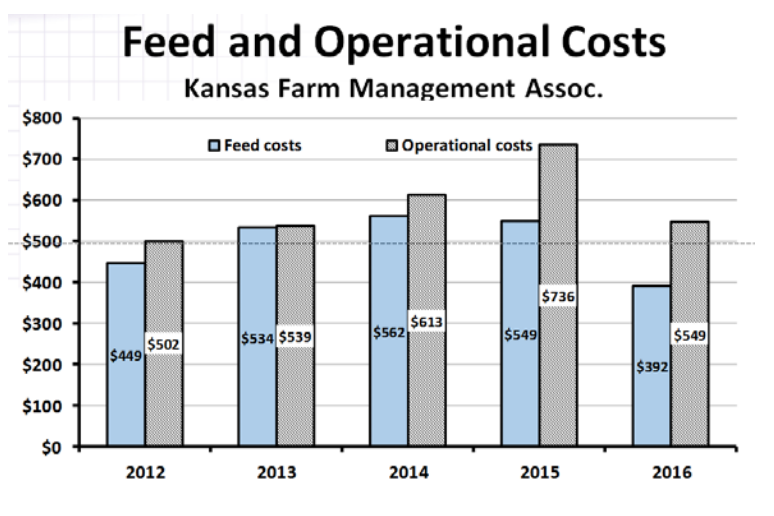 The chart below shows the total feed and non-feed (operational costs) of KFMA participating cow-calf producers from 2012 to 2016. The New Year often brings colder temperatures to the Sunflower State and the Great Plains. Most cattle producers appreciate that cold weather increases nutrient requirements. However, what increases? and by how much? Cattle are most comfortable within the thermoneutral zone when temperatures are neither too warm nor cold. The upper and lower boundaries of the thermoneutral zone are referred to as the upper and lower critical temperature. During the winter months cattle experience cold stress anytime the effective ambient temperature, which takes into account wind chill, humidity, etc., drops below the lower critical temperature. The lower critical temperature is influenced by both environmental and animal factors including hair coat and tissue insulation (body condition). The table on the next page lists the estimated lower critical temperatures of cattle in good body condition with different hair coats. In wet conditions cattle can begin experiencing cold stress at 59°F, which would be a relatively mild winter day. However, if cattle have time to develop a sufficient winter coat, the estimated lower critical temperature under dry conditions is 18°F. Cold stress increases maintenance energy requirements but does not impact protein, mineral or vitamin requirements. The general rule of thumb (for a cow in good body condition, BCS = 5 or greater) is to increase the energy density of the ration by 1% for each degree (Fahrenheit) below the lower critical temperature. The classic response to cold stress in confinement situations is an increase in voluntary intake. However, it has been documented that cattle maintained in extensive environments (native range, wheat pasture, corn stalks) may spend less time grazing as temperatures decline below freezing, which reduces forage intake (Adams et al., 1986) and makes the challenge of meeting the cow’s nutrient requirements even greater. In many cases, feeding a greater amount of low-quality hay will replace grazed forages but may not provide sufficient energy. Therefore, providing additional energy by feeding a higher-quality hay or fiber-based supplement (DDGS, Corn gluten feed, or Soybean Hulls) may be required.